This Balisong knife from Corrie Schoeman is a hand-made piece. The handle features mammoth ivory inlays and bronze bolsters. The liners and titanium backstrap are filed. The back spacer features Citrine and Ruby inserts. Damascus latch. 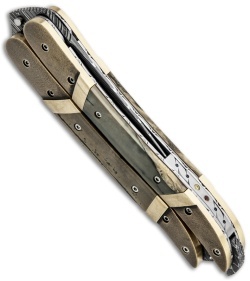 The blade is Damascus steel with a file worked spine. 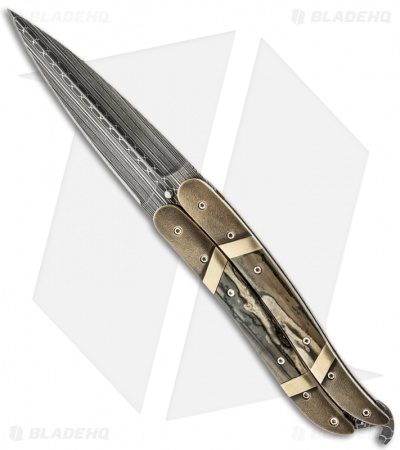 This is a spectacular knife that will make a great collector's piece. Pictured above is the actual knife for sale. This knife was made in March 2013. Corrie Schoeman has been making knives for 30 years and his work is timeless, both in terms of quality and aesthetics. We love the uniqueness of each piece and we think you'll love these knives too!